Sony Online Entertainment's latest EverQuest expansion pack, Dragons of Norrath features an exciting sub-plot to the series that deals with the origins of dragons and dark forces that have begun to infiltrate the world of Norrath, The game features some incredibly detailed maps, cool new areas to explore plus other feature. This update also includes enhanced models for some creatures, an improved world map and much faster weapon switching thanks to the new Bandolier feature. As usual, the high-quality title offers smooth, polished online roleplaying, so read our review and find out why Dragons of Norrath should please EQ fans. Taking the classic Everquest series in a darker, more violent direction, SOE's newest expansion pack, Dragons of Norrath explores the mythology of its world's monsters as players try and discover the secret origins of the Dragons. After a sequence of ominous events occurs, the magical and mystical land of Norrath finds itself plunged into a dark age of war and destruction. The forces of darkness have seeped into the game world, releasing hundreds of dragons and other minions of evil such as goblins and skeletons. The plot deepens with the appearance of Firiona Cie and her archrival Lanys T'Vyl, both of whom find themselves drawn into these events slowly but surely, as the inexorable rise of the age of war becomes more tangible. 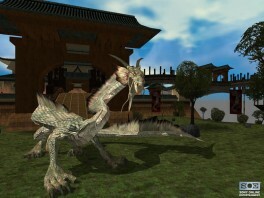 As these forces overcome Norrath, the ancient home of the Dragons, known as the Nest comes into view after being hidden from view and sealed for many years. However, the premature finding of the nest has caused a great deal of chaos, as the dragons who reside there were released and brought death and destruction to those not on their service. 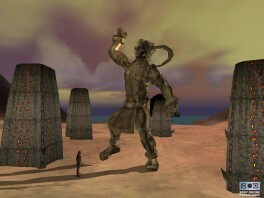 The game's darker edge is immediately apparent, as players find themselves in bleak environments known as Halas and Lavastorm, each populated with a variety of evil forces and dangerous foes. Dragons of Norrath's gameplay is fairly traditional by EQ standards, but the game's overall feel is much darker than many players are probably accustomed to. The quests and adventures are straightforward in their structure and approach, though you shouldn't attempt these missions if you're a novice to the series. This expansion's story line is interesting and the new missions are quite challenging, but Dragons of Norrath also includes several additional features that improve the gameplay immensely. The first thing players will notice is the improved world map, which is features an interactive approach. Players can now click on the maps and change from world to continent views instantly, making traveling and navigating much easier. Another significant improvement comes in the inventory system that offers two major changes. Players can now use the Potion Belt to access and use magic items much faster. This comes in quite handy during some of the more intense battles. Since there are many new spells and trade recipes in the game, improving this area seems like a no-brainer. There's also a new Bandolier system, which holds items such as weapons and likewise offers players the ability to equip different sets of weapons and switch between them almost immediately. Dragons of Norrath also expands the traditional barter system with a much more robust interface that makes trading with other characters much easier. These basic system enhancements sound like small changes on their own, but taken together represent a huge improvement from previous titles. 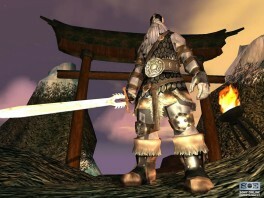 Dragons of Norrath's other changes come in the guild system, which has also been streamlined, making it easier to use. Setting up parties and joining adventures is quicker thanks to the new Find Guild command. This function automatically looks for guilds that are recruiting players. This new system also allows you to get right into the action without wandering around for hours looking for like-minded players. You can also set up their guilds to recruit additional players by using the new Looking for Members tool, which makes building your membership rolls much easier. Players will also find several new features when they arrive at their Guild Halls, including the ability to place weapons and other items into the Guild Bank that are then accessible by all members of the Guild. Players can also reserve specific items for other Guild members if they wish. Each guild also features a regeneration pool, where you can regenerate your character's mana and health points between battles. Each guild can also store numerous Tradeskill objects and items for easy access by its members. Once you go on a quest with your fellow Guild members, you may find yourselves defeated and massacred, but can use the special Mass Corpse Summoning Altar to recall and revive members of your guild. These new features enhance the gameplay significantly, making Dragons of Norrath an excellent upgrade from this standpoint. In addition to these welcome gameplay and interface upgrades, Dragons of Norrath also features some impressive upgrades in the visual departments. The new environments are much richer and more detailed than previous EQ titles, with enhanced texture mapping and lighting effects making each world feel more realistic than before. Each of these new worlds is quite large with many new areas that make for expansive, satisfying quests. As you'd expect, the production values are excellent, featuring outstanding character and monster design that creates a cohesive, believable gaming world. The immersive EQ experience is enhanced by an epic music score and excellent voice acting that brings the world of Norrath to life effectively. Along the way, players will encounter some different and unique foes such as goblins, drakes and ominous boss characters like the Frost Giant, that give players new, refreshing enemies to face. These new foes pose a different kind of challenge, and will test the player's skills. The effort is proven worthwhile, since defeating them also brings new rewards and items for players to use such as potions, coins and more. Despite the recent release of EverQuest II, it's encouraging to see that SOE hasn't forgotten the many fans of the original series, and are instead still supporting its users vigorously by continually releasing excellent add-ons. With an impressive array of new features, items and mission, Everquest: Dragons of Norrath should exceed most gamers' expectations of expansion packs. Offering numerous interface and gameplay upgrades, this definitely marks a significant step forward for the series. The game's quests offer an interesting change of pace from most previous EQ adventures, with a darker storyline that expands the EQ universe's darker elements. 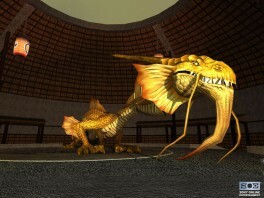 The game's many new enemies present quite a challenge, especially the army of dragons that are much tougher to defeat. Dragons of Norrath is an excellent add-on for the game that adds more than a few extra missions. This intriguing side-quest and storyline work well to create challenging and addictive gameplay, making it an essential purchase for fans of the series.